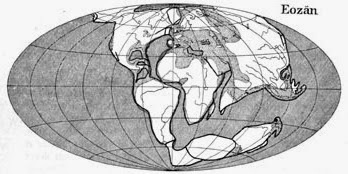 History of Geology: January 6, 1912: Happy Birthday Continental Drift! January 6, 1912: Happy Birthday Continental Drift! January 6, 1912 the German meteorologist Alfred Wegener presented in a lecture entitled “Die Heraushebung der Großformen der Erdrinde (Kontinente und Ozeane) auf geophysikalischer Grundlage” (The uprising of large features of earth’s crust (Continents and Oceans) on geophysical basis) for the first time his hypothesis of the ancient supercontinent Pangaea, from which all modern continents split apart. Wegener didn’t propose something completely new; as he based his idea on earlier observations and suggestions, but his work started a fierce discussion in the scientific community. In 1889 and 1909 the Italian musician and naturalist Roberto Mantovani published a hypothesis based on his observations on the volcanic island of Réunion: cracks forming during volcanic eruptions could separate even large parts of an island, could it then be possible that entire continents split apart? 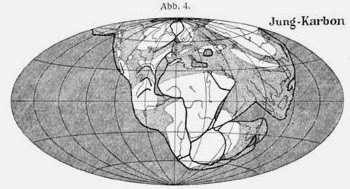 Mantovani collected various evidence and published maps to show the shape of the hypothetical former continents (Wegener will use these maps to support his idea), however he explained the driving force behind the breakup of former large continents by the slow expansion of the earth. In 1908 the self-educated geologist Frank B. Taylor proposed that the crust of earth was influenced by tidal forces of the moon and the continents were pulled apart in some regions and pushed together in other areas, forming folds like a carpet. However the involved forces were to weak and his explanation wasn’t deemed plausible. The Austrian geologist Otto Ampferer speculated in 1906 that the Alps were formed by folding of the upper crust, as driving force he proposed magma sinking into the mantle and pulling pieces of crust downwards (!). 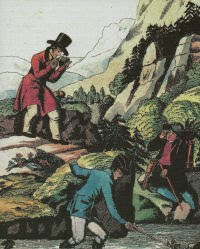 This “Unterströmungstheorie (also Subfluenztheorie)” lacked however a convincing source of energy and couldn’t explain all aspects of the genesis of the Alps, as it implied only pulling and not compressive forces needed to form folds and faults. Wegener became interested in the idea of a single continent in 1910 by observing an atlas and noting the coasts of the Africa and South American. Some time later he read a paleontological paper discussing the similarities of terrestrial fossils between separated continents. - Like a puzzle also the outlines of continents (especially the continental shelves) seem to fit together. - There are various geomorphologic and geological similarities along the coasts of South America-Africa and Europe-North America. - Fossil of land vertebrates and plants can be found on different continents, separated today by large oceans. - Fossil evidence of ancient climates, today without a recognizable pattern, will form climate zones when the continents are put together. Wegner considered the prevailing explanation for the patterns in the fossil record as impossible: ancient land bridges that connected continents and habitats (like the Isthmus of Panama today) were composed of light continental granitic crust, such pieces of less dense rocks couldn’t simply sink into the much denser oceanic basalts and disappear without trace. “You consider my primordial continent to be a figment of my imagination, but it is only a question of the interpretation of observations. I came to the idea on the grounds of the matching coastlines, but the proof must come from the geological observations. Wegener hypothesis of continental drift (a catchy phrase adopted mainly by the critics, as Wegener talks more general of “displacement theory“) was received with mixed feelings. Most geologists regarded it as cherry-picking of anecdotes from the literature. However some geologist with field experience, especially in Africa and South-America, became soon convinced of this possibility. Like Taylor also Wegener could not explain the forces necessary to move the continents in the crust. Wegener imagined that continents - like gigantic ice floes - swim on and are surrounded by the much denser oceanic crust. He proposed gravitational pull, tidal and centrifugal forces, but the English geophysicist Harold Jeffreys demonstrated that these forces are much too weak or if strong enough, had to stop first earth’s rotation. Wegner himself reacted to the critics and tried to respond to them in various editions of his books, however with moderate success. The greatest problem remained the lack of direct evidence for the movements of continents and the needed explanation for the mechanism and also the large amount of energy needed to move and deform rocks. Most importantly Wegener considered his work as starting point and stimulus for other or even future scientists, a message that wasn’t fully understand at his time. Fig.1. – 3. “Eppur si muove!” Reconstruction of the former supercontinent of Pangaea and the subsequent breakup in various smaller continents from the Carboniferous to the Quaternary. 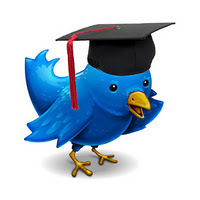 From WEGENER, A. (1929): Die Entstehung der Kontinente und Ozeane. 4th ed. Wegener will die in 1930. 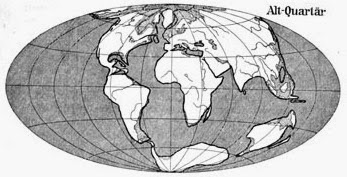 His continental drift hypothesis is in many aspects erroneous: not the single continents move but entire plates of the crust and the driving force comes from within the planet, not from outside. However his most important legacy is to have introduced the idea of moving continents to the scientific community and the public (even Lovecraft will became inspired by Wegener’s writings) – decades later this legacy will influence a new kind of theory: Plate Tectonics.